Hi everyone! My first project I would like to share with you is titled "Adorable". This is my grandpa's picture of Shirley Temple when he was stationed at Hawaii. 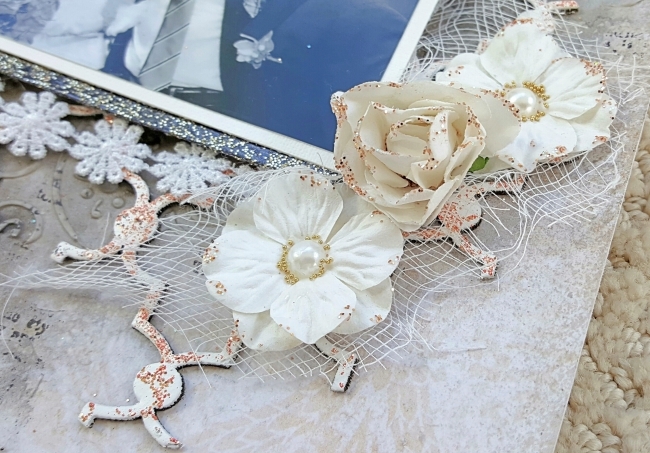 I used the Memoires Collection paper for my background along with the Photographic Record paper and Calling Cards paper to layer behind the photograph. I sprinkled Twig seedlings over matte gel and a stencil. Here you can also see that I used two pieces of Lace 12 behind the photo and the paper layers. The long chipboard piece is the Destiny Collage chipboard that I originally embossed with Black Gold embossing powder for a different project but changed my mind (lol). 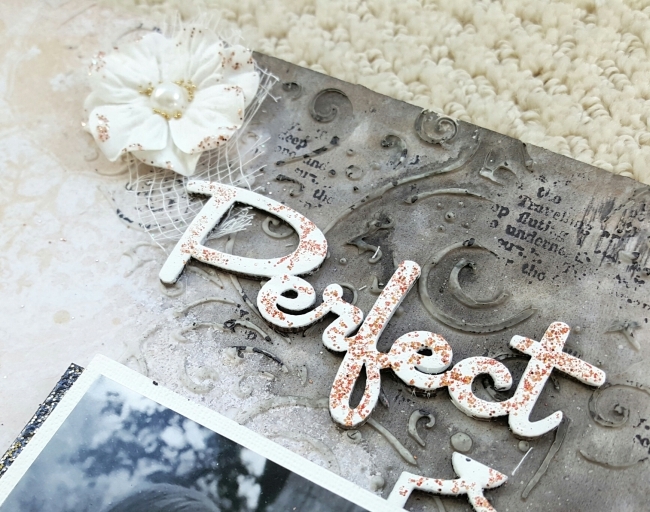 So over that embossing powder, I embossed the chipboard with Pure Red and Seven Seas embossing powders. Using the Crackle Textures stamp, I embossed the areas with Ivory embossing powder. 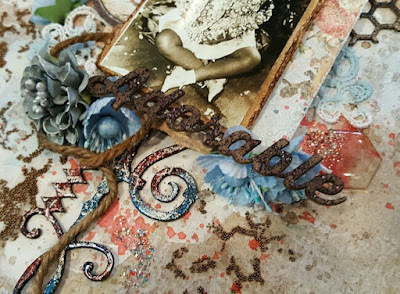 For the Adorable chipboard title and the Bits of Honey chipboard pieces, I used brown distress ink to color the pieces then used the Crackle Textures stamp with Dark Chocolate embossing powder over areas of the chipboard. 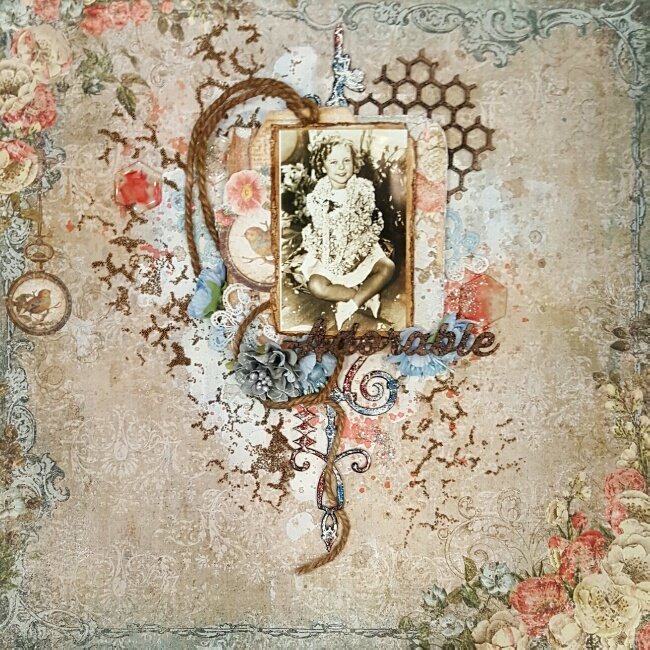 The small blue flowers are from the Chesterville Blooms set. In several areas around the page, I sprinkled a bit of Russett glitter and Blue Ice glitter over matte gel. 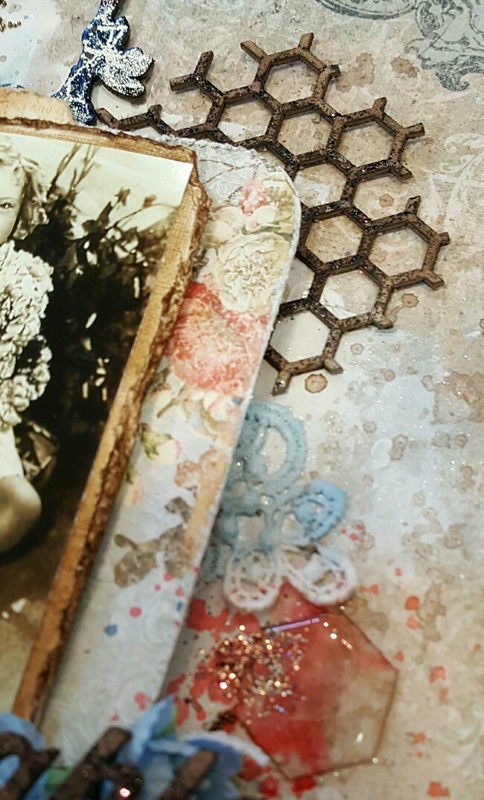 And finally, you can see a close-up of the Bits of Honey chipboard and the piece of Lace 12. 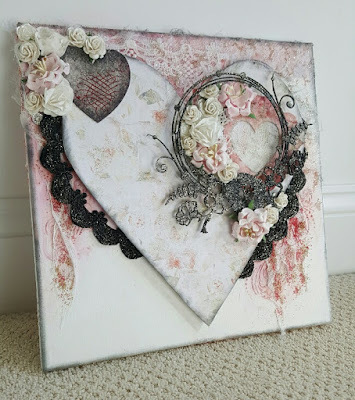 For my second project this month I stepped outside my comfort zone and tried a shabby chic canvas. 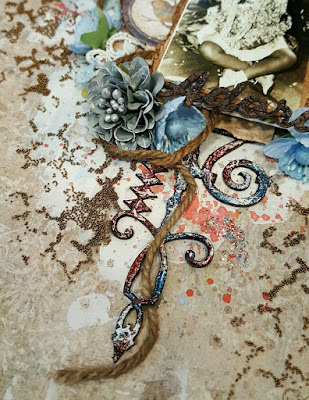 I used a ton of Blue Fern Studios products from this collection for the canvas! The main heart on the canvas is the Blissful paper from the In the Mood Collection. 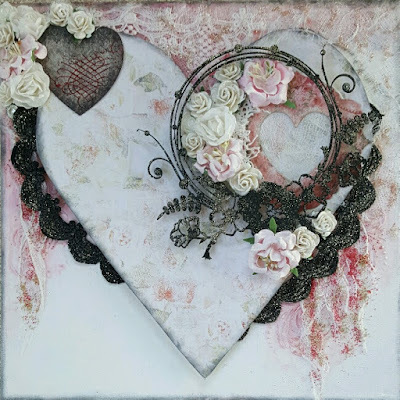 The red frame and black heart to the top left of the canvas are Printed Chipboard pieces from the In the Mood Collection. The design on the black heart is the Penned Flourishes stamp embossed with Pure Red embossing powder. 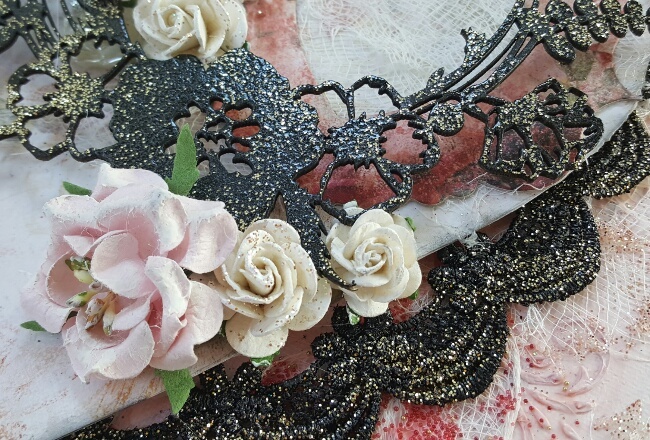 Lace 3B is the black lace that I embossed with Black & Gold embossing powder. The circle floral frame was also embossed with the Black & Gold embossing powder. Lace 12 is at the top left of the canvas and very elegant. Beating Heart and Gold Nugget seedlings were applied with matte gel over some cheesecloth. I used a stencil with glass bead gel to the top left side of the canvas then sprinkled some Mocha glitter over the design. 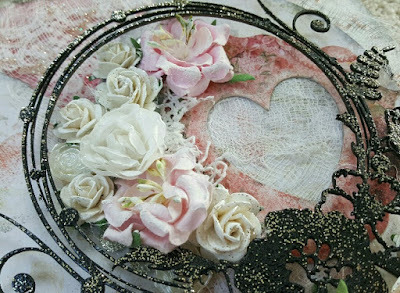 The large white rose in the center of the cluster is from the Garden Blooms set, while the pink flowers are from the Moody Florals set. To fill in spots on my canvas I used some old roses from my stash and put gesso on the tips and sprinkled with Rose Gold glitter. 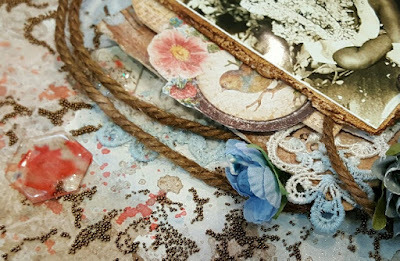 My final project this month is a very basic layout using some of the the In the Mood Collection along with other collections. The background paper is Amused from the In the Mood Collection. 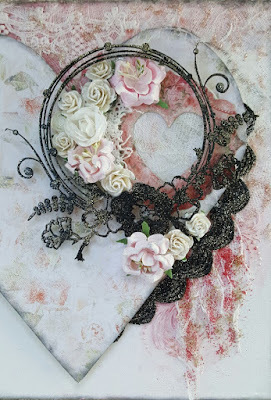 I created the background with modeling paste, stencil, and black spray stain. Then I stamped it with the Tattered Newsprint stamp. 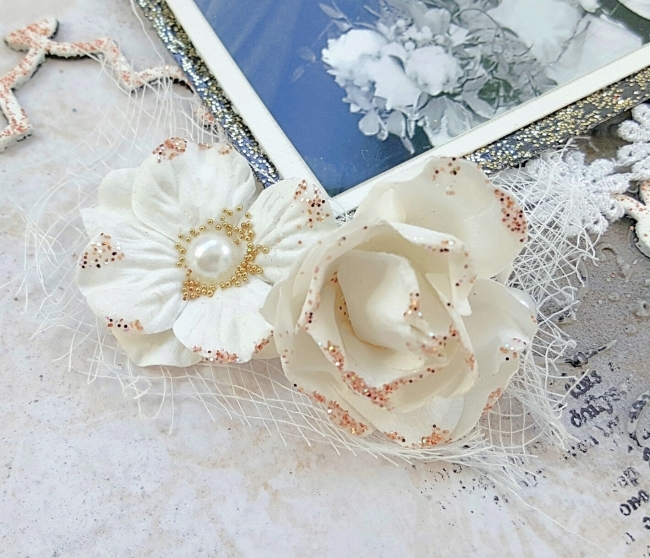 The two white roses are from the Garden Blooms set and the other flowers are from the Apricot Blooms set. For each flower on the page, I used matte gel on the tips of the flowers and sprinkled Mocha glitter on the tips. For the Apricot Blooms, I removed the flower stamens and replaced them with a pearl using matte medium then sprinkled Gold Nugget seedlings around the pearls. To go along with the glitter theme, I used Black & Gold embossing powder as part of the matting behind the photo. 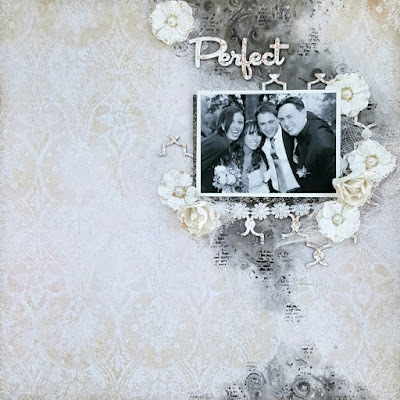 Under the picture the Lace 10 adds a nice soft touch to the layout. The Lattice Panel chipboard and Perfect chipboard title were first coated in gesso, then I painted them with a very concentrated white acrylic paint. Finally, I used the Crackle Textures stamp with Coral embossing powder to add interest to the chipboard. Thanks for taking a look at my layouts and canvas! Hope you have a great day! They are all so beautiful, I love them! !